The Guardian Unlimited did a story recently about the top ten bookshops around the world. These are not your corner Barnes & Noble’s. One is in an 800 year old church, another provides books to British Royals and has been around since 1796, and the shop pictured above is a converted theater. 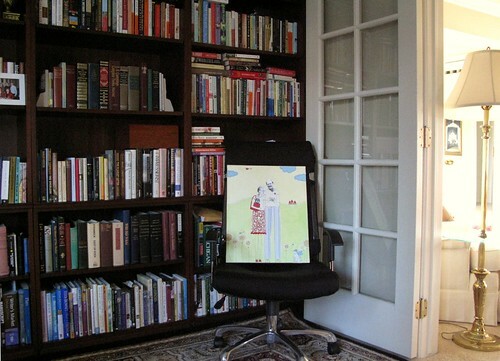 Below is a photo from my own much more humble home office/library. When we first bought the house my husband wanted to call it “the library”. I think he had visions of retiring there in the evenings, sinking into a well worn leather chair, sipping his favorite red cab and smoking a fine, hand rolled cigar. Well I crushed that dream before the perfect shade of taupe paint on those walls was even dry! I mean, he doesn’t even like smoking cigars, he only does it when he’s with his friends after golf, it’s sooo totally a peer pressure thing (and it’s sooo not good for him). We do have lots of books in there though (my books) and a leather desk chair (my chair) at the computer (my computer) and we ended up calling it “the office”, sorry Mr. bookbabie. That darling collage on the spare chair of me and the mister and our two pets (who are now in pet heaven) was done by artist Claudine Hellmuth. After our dog Nikki died, it made me too sad to look at it, but now I’m trying to find the perfect place to hang it. I just snapped the photo this morning and as you can see the living room is flooded with sunlight. I hope it holds, I plan to go for a walk later (Melynn), even though it’s cold, cold, cold! This entry was posted in Books, my life, photos, travel and tagged books, bookshops, library, my life, photos, Reading, travel by Lilli Day aka bookbabie. Bookmark the permalink. Your blog portray the life and literally breathe the peace – wow, the pages revive while reading you – what a pleasure to come to your blog. I dont know how should I say that in English, but I would like to dream over a cup of coffee there and to say anything just burn with the smile of gratitude. Thank you. I like what I see and feel here. What a wonderful article! Thanks for linking to it. I just spent many pleasurable minutes drooling at all the photos and descriptions of those wonderful bookstores. Wow! Thanks for the link to these awesome bookstores!!! It was a pleasure just looking at them. It’s nice to know there are still alternatives in the world to Barnes & Noble, Borders, Amazon and the like. Great blog you got here too!